Last Thursday, the marketing consultants of Mid-America Publishing held a meeting at Block 10 in Sheffield. The group of 11 consultants along with CEO Ryan Harvey, CFO Pam DeVries, and Board Chairman Matt Grohe, spent several hours working through various scenarios and techniques on ways to grow sales, build relationships, and learn about the many products available to them. 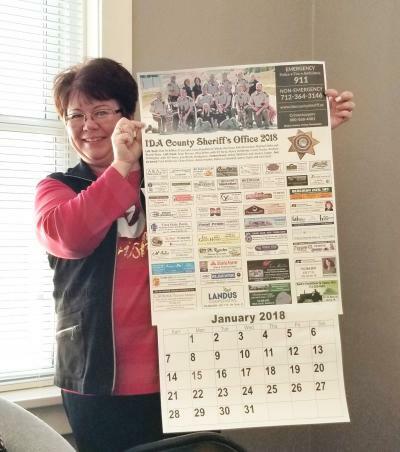 Karla Meier, who sells for the Ida County Courier, Holstein Advance, and Aurelia Star shows off one of her favorite projects from the past year, a Sheriff’s Calendar project, which sold well. The group will re-convene on March 22 at a site to be determined.